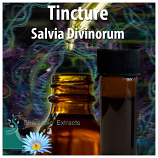 This Salvia divinorum Tincture has been professionally made using a state of the art facility. We strive to provide a pure product and ensure that we use only ingredients that are safe for humans. Our Salvia Tincture is essentially a drinkable version of Salvia extract for sale. Salvia divinorum is plant that is grown is native from Mexico, Salvia Tincture and Salvia Extracts are products that are extract the Salvianorin-A from the plant matter which is the active agent. The higher the concentration the stronger the product.